TULSA, Okla. (June 16, 2017) — This Father's Day, the bond between father and son Thomas and James Owens will be stronger than ever, after recently undergoing surgery together at St. John Medical Center. Thomas needed a kidney donation, and James volunteered without hesitation. James, the youngest child at 33 years old, said he had actually offered his dad a kidney before Thomas was even referred to St. John and told he was eligible for a transplant. "When his kidneys first failed and he went on dialysis, I told him I would donate if it was ever possible," James said. "But at the time, Veterans Affairs told him he wasn't eligible." Thomas served in the Vietnam War from 1969 to 1970, and exposure to Agent Orange left him riddled with health issues. Later, he began to experience post-traumatic stress disorder, and he also became diabetic. "By the time my kidneys finally failed, I had been on a large cocktail of medications for a very long time," Thomas said. "My body just couldn't process the amount of medicine they were constantly giving me. I was having a really tough time." Eventually, he transferred from a dialysis center in Fayetteville, Ark., to one in Grove, where he lives with his wife and their dogs near Grand Lake. A doctor there recommended he look into living donation through the St. John Transplant Center. He had never expected to take James up on his offer. "The whole process was weird for me, because I never once had a doubt in my mind about doing it, but as it loomed closer it definitely became a pressure that’s hard to describe," James recalled. "(The medical team) prepares you for it and was really comforting, especially with me being so far away, but none of it felt real until I went to Tulsa for the first checkup. Every test was a little hurdle for me to get over to be able to donate and do this for my dad." James had flown into Tulsa from Tucson, Ariz., where he is a musician and bartender. He said they found out they were a match on a Tuesday, and the transplant was scheduled for that Thursday. On Feb. 16, about two years after he had started dialysis, Thomas received his son's kidney. 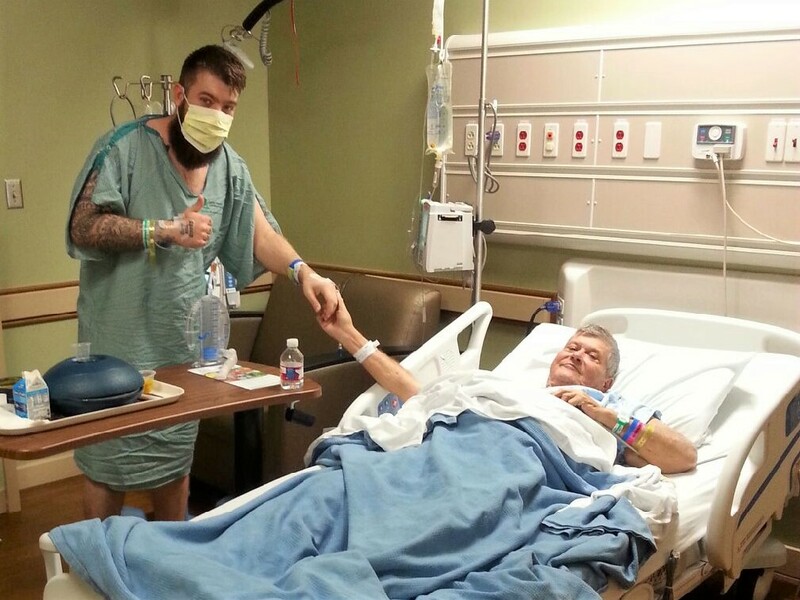 "I didn't get to see my dad until the second day in the hospital," James said. "But it was a really cool moment because I was able to get up and walk, and I walked down to my dad's room. You have these moments with your dad, like where you hit a home run or get a good grade, and you share that moment with him — and we had that moment. We were elated, and he was already feeling a lot better than he had in years." Irfan Kundi, M.D., medical director of the St. John Transplant Center, said a kidney donation from a living donor significantly improves the long-term outcomes of the recipient. "Living donation is an opportunity to save a life while you are still living and spares an individual a long and uncertain wait for an organ from a deceased donor," Dr. Kundi explained. As the transplant nephrologist, Dr. Kundi has coordinated the family's care throughout the process. Transplant surgeons Steve Miller, M.D., and Stephen Confer, M.D., led Thomas's surgery, while Jason Cook, M.D., was the transplant surgeon for James. After the father and son were discharged from the hospital, the family stayed at one of the two "transplant houses" on campus for a few days. The St. John Transplant Center provides this affordable, fully furnished lodging option for out-of-town transplant patients so they can continue to rest near their medical team before traveling home. "We had such a great experience with the St. John transplant team," James said. "Everyone who was involved was absolutely wonderful and addressed all of our needs. You can tell they really enjoy what they're doing. They’re rooting for you. From start to finish, I could text them if I had a question or if something was going on, and they were always available." Thomas agreed: "All of the people at the hospital were fantastic — the doctors, the nurses, the whole transplant team. If I had to recommend anywhere to go for surgery, I would recommend St. John." Thomas said his main concern after the surgery was his son's health. "I didn't want it to hurt him any," he said. "I was more concerned about his health than mine. But (the medical team) explained to me that he had another kidney, and a lot of people live healthy lives with only one kidney. I just praise the Lord that he wanted to do it, and he volunteered without me asking. I think it's wonderful that he would want to do that for me. I'd do the same for him; I'd give my life for him." Both Thomas and James said they are recovering well. Thomas said he has more energy, can breathe better, and is not "tied down" to dialysis three days a week anymore. Now that he isn't on dialysis, he and his wife have planned some trips. James said he returned to work about a month after surgery. His hip-hop group, the Jivin' Scientists, which includes his older brother, landed a record deal last year, and the label extended its deadline to accommodate his situation. He said he hopes to visit in July, the first time since the surgery. In the meantime, he looks forward to calling his dad on Father's Day. "My dad, he's always been kind, calm and loving," James said. "He taught me a lot about what it means to be a man and have responsibilities. Now, a little bit more of my dad is back." Ascension’s St. John Health System operates seven hospitals and more than 90 healthcare clinics and facilities in eastern Oklahoma and southeastern Kansas. St. John Health System employs approximately 8,000 associates. Across the region, St. John Health System provided more than $68 million in community benefit and care of persons living in poverty in fiscal year 2016. Serving Oklahoma for more than 90 years, Ascension is a faith-based healthcare organization committed to delivering compassionate, personalized care to all, with special attention to persons living in poverty and those most vulnerable. Ascension is the largest non-profit health system in the U.S. and the world’s largest Catholic health system, operating 2,500 sites of care – including 141 hospitals and more than 30 senior living facilities – in 24 states and the District of Columbia.